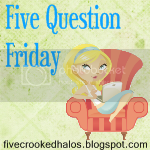 It seems the person that has been hosting Five Question Friday each week is taking some time off. … so, that left me with the decision of whether to just drop my weekly post or just continue each week with my own questions. I kind of like answering random questions, so I’m going to give it a go on my own for a bit. Join me and share your answers! Have you ever seen the ocean? It’s crazy to think about it, but there are some people that have never seen the ocean. I was almost twenty years old before I saw the Pacific ocean. Of course, I live in Florida so seeing the ocean is a regular occurrence for me. What are your favorite pizza toppings? My favorite pizza would have pepperoni, ham, bacon, onions and extra cheese. A barbecue chicken pizza would be my first-runner up. Both so tasty! What is your favorite time of day? Night time is my favorite. Those few hours when the girls are in bed and I can unwind from the day. And it’s not that I don’t love spending time with my girls because I do – promise. But, at night, that’s my “me” time. What did you eat for breakfast? I’ve been on a kick lately of having peanut butter toast for breakfast. I know it’s not exciting, but it’s very filling and maybe a little healthy too? Maybe? What was the cheapest gas price you can remember? And when was it? I went to college in North Carolina and I remember each time we would go to South Carolina, we’d fill up our car with gas, whether we needed it or not. It was always under a dollar there – the lowest I remember was probably 1997 it was 89cents. Ah, those were the days!